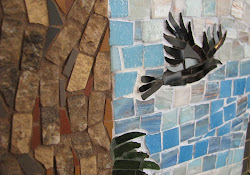 I have been commissioned to make another dragonfly mosaic, this one smaller, and “fun, airy and light”. This leaves me wondering how much whimsy I could/should use. I did some preliminary sketches last night, but haven’t quite settled on a style for it. The client has requested smalti, which I tend to think of as more formal. I will need to break out of that mindset so that it doesn’t turn out stuffy. Below are some photos I pulled from Google images to inspire me. (These are of course, other people’s copyrighted designs, they are just for inspiration.) I’m loving the colors, but I think I’ll want more realism in my piece, so we’ll see where this runs. As I was looking at these pictures, I was thinking that they seemed dreamlike, and I found myself wondering what dragonflies dream about? I think that will be the idea behind the piece. What do you think? Click the picture to hear my radio interview with RT Thomas of Creative Connections. We discuss inspiration, roadblocks, and some of the business issues artists face.